Michelle Davies | The Journal Gazette Mariesa Rang, IPFW limited-term lecturer, shows Daulton Beard of the New Haven Fire Department how to use and communicate with augmentative alternative communication devices on Wednesday. After overhearing a conversation between a firefighter and a man with verbal disabilities, Sharon Mankey knew something wasn't right. “If there's a fire in my house and I call it in, how seriously is 911 going to take my phone call?” the man asked the firefighter. It should've been a pretty simple answer. Instead, Mankey was shocked as she watched the firefighter stare back with a blank expression. “I don't know,” he responded. It wasn't what Mankey wanted to hear. Since that encounter in 2015, the IPFW Communications Disorder Clinic director hasn't looked back. 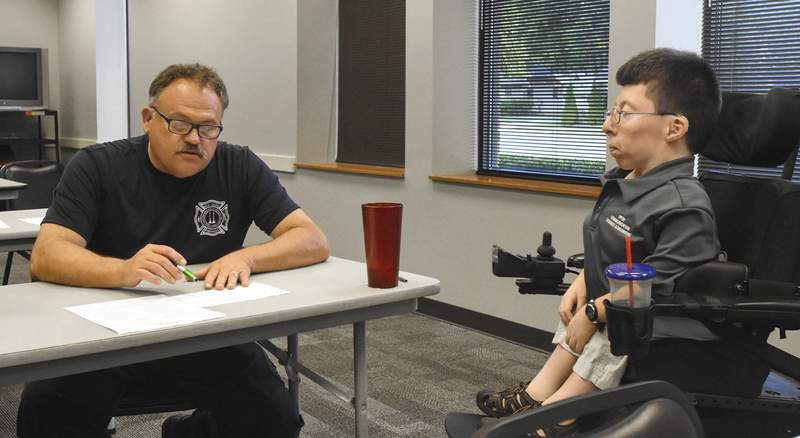 Mankey and IPFW limited-term lecturer Mariesa Rang have been training first responders to communicate with people using alternative augmentative communication, or AAC, boards and systems. The boards help those with verbal disabilities communicate their needs to others, especially in life-threatening situations, making first responders' ability to understand them crucial. With 92 languages spoken in Allen County, the boards can also help break down language barriers. The boards, which range from low-tech to high-tech versions, can include visual displays and voice outputs with a high vocabulary. Users tap visual displays to form sentences, allowing the voice output to get their message across to the first responders. But even before the training began, Mankey, 63, says treatment of the disabled has come a long way. As a kid, she had seen people with disabilities kept out of the public eye, away from the help they really needed. When she attended graduate school for speech pathology, many of her cases dealt with people who were nonverbal. She later worked with a public school system, where Mankey quickly learned no one wanted to deal with kids with intellectual delays, kids she wanted to help. It's a different story for Rang, who, as a person with disabilities, has spent her life knowing the struggle of being understood and helped by first responders. Rang, 29, suffers from both spondyloepiphseal dysplasia, a type of dwarfism, as well as a spinal cord injury that she sustained in graduate school. Mankey and Rang have trained 300 first responders from fire departments and police and EMS stations in Allen County. Yet the training never gets old for the two, especially when they notice the immediate impact. “It's amazing. You can see the light-bulb moment,” Rang says of the first responders' reactions. The moment comes when Mankey and Rang provide first responders with potential scenarios and break them off into pairs. While one person plays the part of the nonverbal victim, the second acts as the dispatcher. Neither has information about the other, making the task difficult, but realistic. While Mankey and Rang have kept their sessions local, the two originally thought their training was something practiced throughout the U.S. But Mankey, who serves on a national committee for augmentative alternative communication, learned it was quite the opposite. Two other members of the committee are also part of the United States Emergency Preparedness Team, which help communities prepare for and recover from natural disasters. As Mankey explained the training to one of them, the woman's eyes lit up. But Mankey and Rang weren't in trouble. As far as the two Emergency Preparedness Team members knew, no one else was conducting official training sessions like they had been doing. One of those women, Sarah Blackstone, serves as part of the Community Emergency Response Volunteers of Monterey Peninsula in California. “It's not about the technology, it's about establishing some kind of understanding with that person and getting meaning out of that situation,” said Blackstone, who hopes to raise a national awareness for augmentative alternative communication. “If you stick a communication board in front of someone, and you don't know how to use it, it becomes a barrier because it's not common,” she said. As Mankey and Rang's sessions continue to spread throughout Allen County, their training will be a significant step forward for first responders nationwide.